In October of this year the Federal Financial Institutions Examination Council (FFIEC) released a Frequently Asked Questions (FAQ) Guide for the Cybersecurity Assessment Tool (CAT). Aside from forcing me to cram a large amount of acronyms into the title of this article, what does the FAQ tell us? Many of our financial institution clients have been asked to provide the results of their CAT assessment. And in many cases the examiner’s approach certainly does not make the tool feel voluntary in any way. The way the CAT results are being treated by examiners makes the tool seem like a hard and fast requirement. In theory, an institution could use the response above from the FAQ to argue their point. But arguing with an examiner right out of the gate is usually not a great approach. And as I mentioned previously, the FFIEC has called the tool mandatory since its release in June 2015. 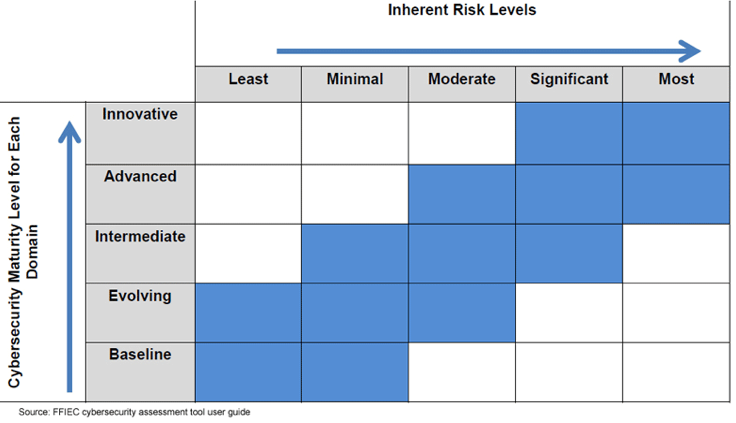 At Rivial we incorporated the CAT control framework into our risk assessments and IT audits to help our clients. Trust services: Thought of broadly to include fiduciary services for individual clients (e.g. personal trusts and investment management accounts) and corporate clients (e.g., employee benefit plans, endowments/foundations, and bond issuances), non-fiduciary services (e.g. retail brokerage, custody services [securities, cash and documents], and security-holder services [transfer agent]). Also may be referred to as asset management products and services. Treasury services: A broad collection of services, including but not limited to cash management, liquidity management, trade finance, and information services, offered to corporate or business clients. These services are typically offered through an investment bank. If you want more information about FFIEC requirements or the CAT, drop us a line at info@rivialsecurity.com. Or you can Join the Club using the form to the right.